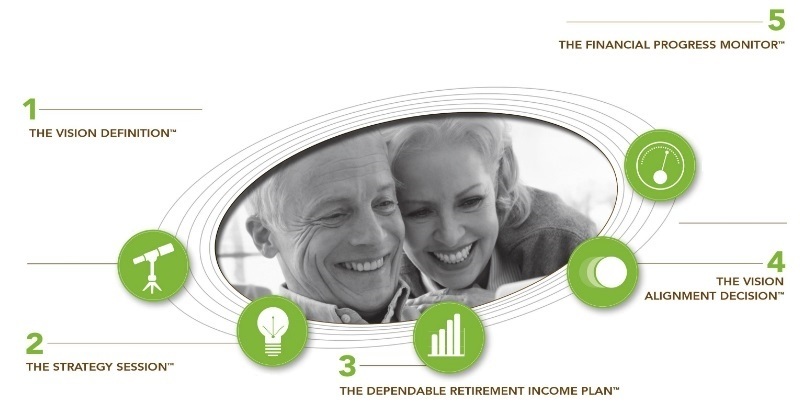 The Dependable Retirement Income Solution is our process for retirees like you who are concerned over not having adequate income in retirement. We recognize that as you enter this next stage of life you have questions about how to maximize social security, structure investments for income, minimize taxes and plan for long term care needs. We feel we have the expertise to guide you through this critical stage in your life. Our process begins with a personal interview designed to alleviate your concern of not having an adequate amount of income in retirement. Out of this stage emerges a customized game plan to help you take control of your finances and articulate your vision. In the Strategy Session™, we organize your financial documents and build a detailed profile so that we may precisely understand your personal balance sheet; identify risks that could impede your plans; and address them in the context of your current asset allocation. By carefully arranging your affairs and records, you’ll gain confidence in knowing where you’ve been and where you’re heading. Connecting goals to action, lifestyle to finance, and dreams to results, we evaluate your present financial condition and offer practical recommendations using clear, understandable language for how to achieve your vision of a comfortable retirement. This stage involves stringent protocols for researching and testing financial models, careful analysis of combinations of solutions, and coordination with your other financial advisors. With goals in sight, great care is taken to ensure that your implemented plan is aligned with your vision. As your unifying voice in the planning process, we create a welldefined action plan that contains sequenced steps, guidelines and due dates. As part of this stage, we provide an objective evaluation of possible funding methods such as investments and long term care insurance. To ensure that you have adequate resources for yourself and future generations, we establish regular reviews to gauge your plan’s performance, and make adjustments for changing laws, regulations, market conditions, and investment performance. This commitment to measure your progress also takes into account your changing personal and financial circumstances.